A strong Doncaster Rovers side were given a lesson in finishing by Newcastle United’s youngsters in the Checkatrade Trophy. Grant McCann’s men enjoyed the greater possession, territory and goal attempts on a low key night at the Keepmoat Stadium. But they went down to an enthusiastic Newcastle team who executed their counter-attacking game plan to a tee and took their chances when they came along. McCann has outlined his desire to do well in this competition but it was still something of a surprise to see Marko Marosi, Andy Butler, Herbie Kane, Tommy Rowe, Mallik Wilks and John Marquis in his starting line-up. Only Ben Whiteman and James Coppinger were given the night off. His team controlled the Group G opener for long periods but could not make it count on the scoresheet and were unable to build on Saturday’s positive display at Peterborough United. After Thomas Allen put the Geordies ahead against the run of play it was an over-hit cross by John Marquis that saw the sides go in level at the break. Rovers knocked on the door in the second half, albeit without too much conviction, but were twice caught on the break as goals from Callum Roberts and Elias Sorensen earned Newcastle the points. Captain Tommy Rowe hobbled off during the first half and Mitchell Lund also went off injured to add to Rovers’ growing injury list. 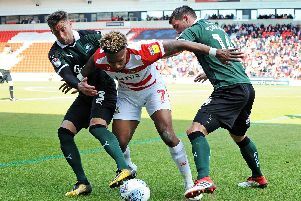 Doncaster had the ball in the net from their first meaningful attack but, after Wilks' initial effort came back off the post, Marquis's instinctive finish from close range was ruled out for offside. Newcastle's youngsters had to withstand more early pressure and looked susceptible out wide and somewhat panicky defending crosses. The visitors could barely get out of their own half before taking the lead totally against the run of play on 14 minutes - in clinical fashion. Owen Bailey's slide-rule pass split Rovers wide open and Allen coolly did the rest, rounding Marosi and tapping home. The goal knocked the hosts out of their rhythm and despite dominating possession they struggled to make any serious attacking inroads. Alfie Beestin saw a looping header tipped over the bar by Nathan Harker and Wilks had a shot deflected wide. However, Rovers deservedly drew level during nine minutes of first half stoppage time - caused by an issue with one of the nets - when Marquis sent a cross over from the right and it flew over Harker and into the top corner. Branden Horton, who replaced Rowe at left back, registered the first attempt of the second period but his well struck effort arrowed over the bar. The ever-impressive Kane, who pulled the strings in the central midfield role, went closer just before the hour mark but dragged his shot from the edge of the box narrowly wide. Rovers seemed the team most likely to score the next goal but, after 65 minutes, the visitors struck again - and again it came out of the blue. Substitute Adam Wilson broke down the left and laid it across for an untracked Roberts to coolly stroke home. Horton tested Harker’s handling from distance and Rovers continued to gently probe. But it was game over on 86 minutes when Sean Longstaff played a ball through for Sorensen to poke home past Marosi and round off a clinical display from the visitors.